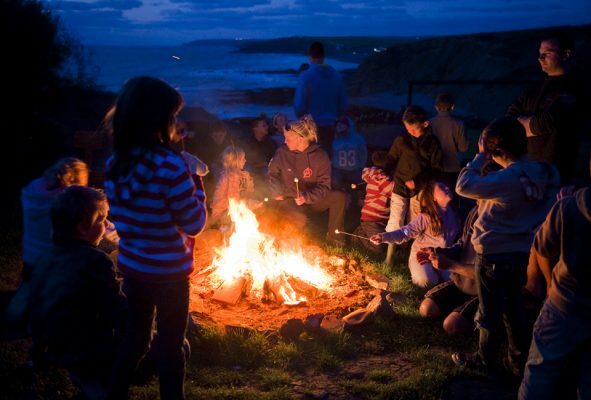 The Easter holidays are in full swing, and we have students revelling in the North Cornwall landscape as they go from one exciting activity to the next, building trust with their classmates, keeping fit and, of course, having fun doing it! No matter the size of your school class, we will be able to accommodate, as we have room for 65 pupils and staff, allowing us to offer a tailor-made and personal outdoor experience to each group. This not only benefits them but us too, as we can engage each student on a personal level, making new friends in the process. They experience new, exciting and challenging activities. The activities bring out hidden strengths and talents in the students. The activity week will boost their self-esteem and confidence. It will develop their social skills. Their primary school class will become a stronger team. We have over 15 fun-filled individual activities that will take you from the Atlantic Ocean to granite cliff faces and everywhere in between. 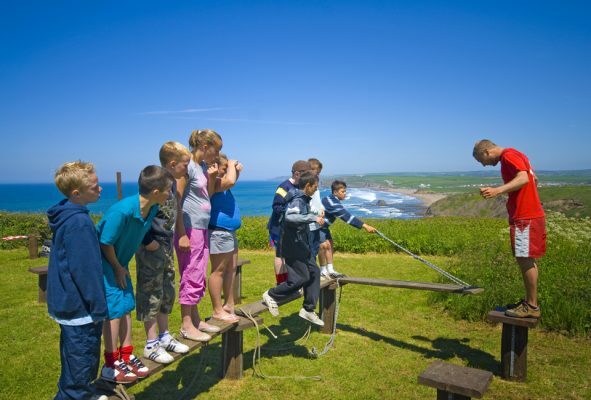 Below you will find four of our most popular activities that can be experienced on our school residential trips. Our team building activities are a way of introducing and encouraging the pupils to learn the skills to be successful in life. Our skilled instructors will use scenarios and activities that will help the children to develop their personal relationships, leadership, communication and listening skills. During the activities, students will soon learn that everyone’s opinion and input matters as they identify the strengths in other’s while respecting each others differences and opinions. Surfing is the world’s most popular water sport and is arguably the most popular activity at OA, according to our guests anyway! 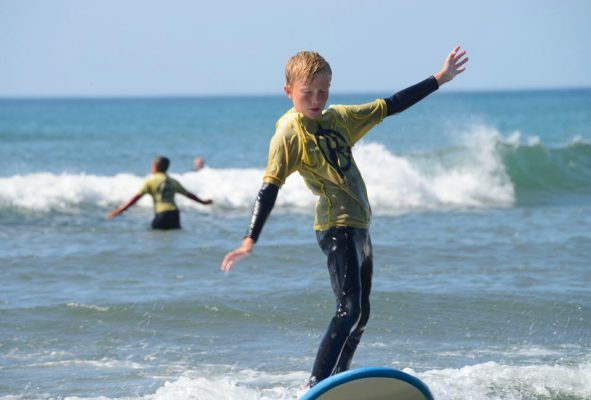 Our surf lessons take place right outside the centre’s front door at Widemouth Bay, which produces fun peeling walls for the students to learn the skills on at all stages of the tide. Primary school students are the perfect age to learn this new sport as they have exceptional balance and enthusiasm. Even if they’ve never been on a board before, our highly skilled instructors will have them gliding across the wave in no time! OA HQ is perched on the granite cliffs that overlook the Atlantic Ocean, and with that setting, it was only right that we should take advantage of the Cornish landscape by hoisting out the ropes and abseiling down them! 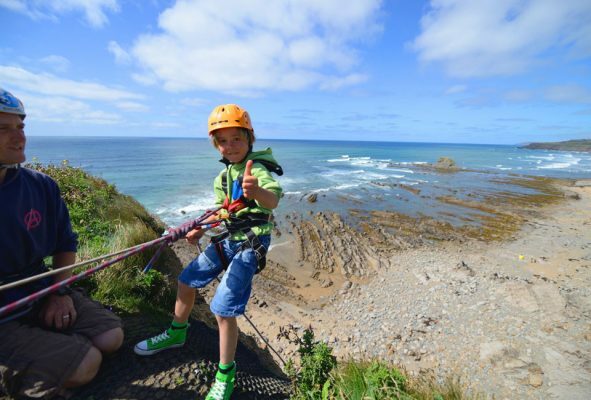 From 20-foot faces that taper down to the ocean to a more adventurous 70-foot abseil, there is a path for everyone. Our abseiling activity is an excellent way of building personal confidence and trust in others; once they reach the bottom they’ll be running back for another go! Cornwall is known for its incredible ocean activities, but there are also some excellent activities to undertake in fresh water too, with Canadian canoeing one of the best! Taking place in the Bude Canal and nearby Tamar Lake, Canadian Canoeing is a rapidly growing sport that originates from the method of transport that Native Indians used. This is an extremely fun team sport as the canoe holds from two to four people, ensuring lots of fun as the students negotiate the rapids of the canal.